This training gives participants an object lesson on how to use creativity and humor to improve communication, energize teamwork, and build deep bonds of loyalty. Using learning to juggle (with colorful, lightweight nylon scarves) as both a medium and a metaphor for managing multiple responsibilities, participants experience firsthand the benefits of being in a flow state that fosters both concentration and relaxation. Communication models boost confidence in capacity to overcome obstacles by pooling resources, and playing to people's strengths. 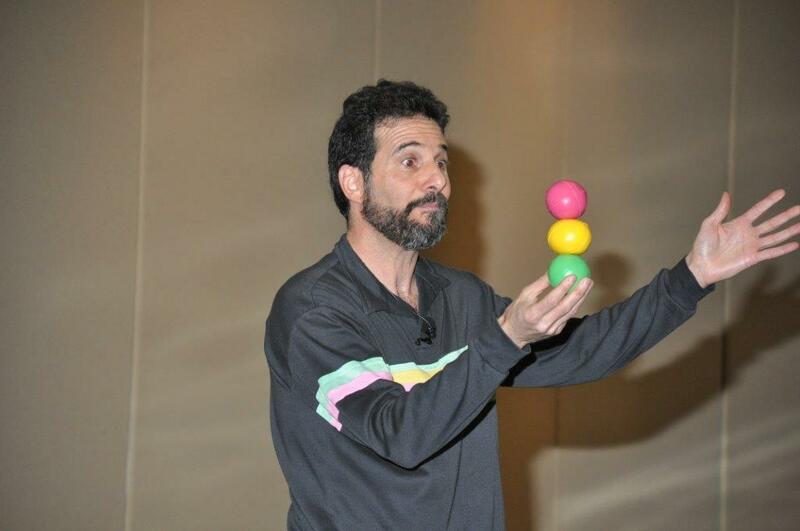 We greatly enjoyed the object lessons Rob put us through involving juggling and improvisation. What we learned from doing them about ourselves and our colleagues deepened our ties and gave us a more optimistic view of our future… Comments confirmed my personal observations that the blend of topical humor and targeted exercises kept people's attention fully engaged. A delight to work with... The way he tailored his performance to include industry specific language, perceptions, common trends and ideas was so good that audience members asked me if he worked in our industry….Clearly his message rung true. Attendees evaluate each speaker and quantify their message, content, and delivery. Rob received a 95% rating…. He made me look good!